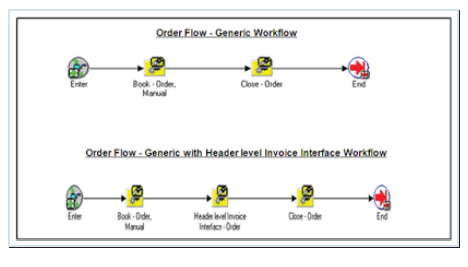 Oracle Order Management uses Oracle Workflow to control the sequence of events that occur in the processing of orders, quotes, sales agreements, returns, order lines, and return lines. Oracle Workflow manages activities, executes functions, sends notifications, maintains completed activity history, detect errors, and initiates error processes. Oracle Order Management seeded workflows and their associated activities are contained in oexwford.wft file. The Transaction Type determines the header level process used at the header level on an order. The Transaction Type window is used to assign the order flow to the order header Transaction type. 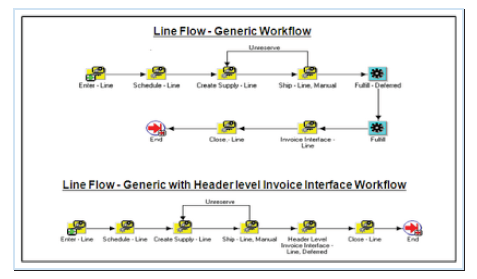 The combination of order type/line type/item type determines the line workflow. If you leave Item Type blank, the workflow applies to all item types for the line type (unless they have a specific assignment in this form). 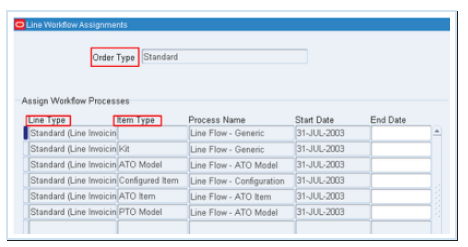 In Process Name, select the workflow that Oracle Order Management should use for the order type/line type/item type combination. If you do not assign a workflow to a configured item type, the configured item does not use a workflow. You can perform all standard processing including orders, returns, drop-ship orders, Orders for configured items, and orders for assemble-to-order items using seeded workflows.